It’s one thing to be scammed by an organization you don’t know. It’s another thing when an organization to which you belong (and pay dues to no less), decides to increase their cash flow at your expense. I’ve been a happy member of AARP since I was, wait for it, 55. I got an invitation to join in the mail. Wow, this was before the NSA, Big Data and The InterWeb. I was mystified that AARP could have possibly known when I turned 55? Those happy days are over. Oh how the world has changed. But not changed that much. The other day I received another invitation from AARP, which looked like it was reminding me to renew my membership. I was about to write a check, until I realized it wasn’t time to renew and did a double-take. Upon closer inspection I see that as a Valued Member I should ‘Reply by’ September 30, 2014, not ‘Renew by’ September 30, 2014. 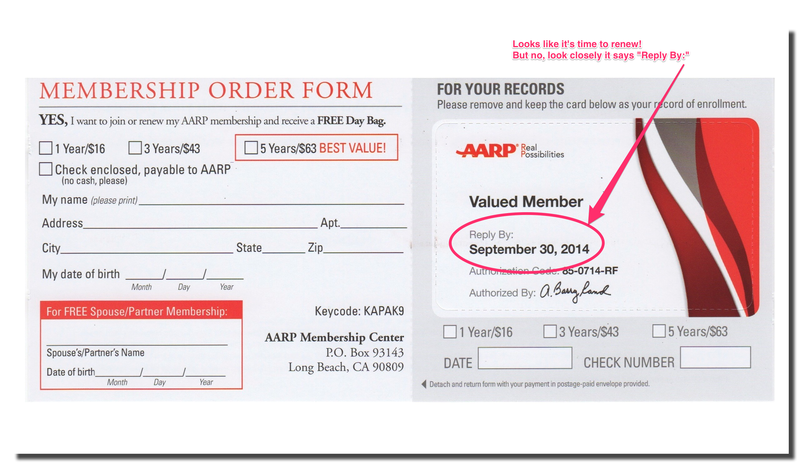 I think AARP knows exactly what it’s doing here, and many of their members will wind up renewing before it’s due. The card identifies me as a ‘Valued Member’. The card was alone in the envelope, just like the normal ‘renewal’ card. The form includes a ‘punch out’ membership card, identical in styling to the normal ‘renewal’ notice. There was no brochure extolling the many benefits of membership, which would serve to recruit new members. I wonder if I replied and sent a check whether from now on I’d get twice as many renewal notices. This reminded me of a similar membership renewal over-reach by CSAA I described several years ago. While this is not the worst case of mis-representation in the free world, it’s not completely innocent either. So I’ll label it ‘Scam-Lite‘.